It’s that time of year again - same place, same stand. 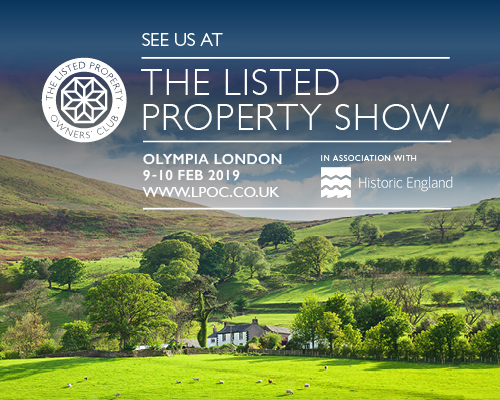 We are looking forward to exhibiting at The Listed Property Show this weekend, at Olympia London. This is a great event for everyone involved with listed buildings, a chance to catch up with old faces and make new friends. We’re on our favourite stand again, B6. Do come along to say hello. The first exhibition of painting in the award – winning new extension at Tate St Ives. The high ceilings, extensive white walls and diffused, overhead daylighting make it perfect for showing Heron’s big, bold, colourful abstract paintings. I recently visited the extension to Tate St Ives and am happy to report a thumbs up! Designed by Jamie Fobert Architects it’s been shortlisted for the 2018 Stirling Prize. The new gallery is sunk deep into the cliff and benefits from beautiful St Ives daylighting via the cleverly designed roof that successfully combines 6 light chambers with massive in – situ concrete beams spanning the 16.5m width. Barbara Hepworth’s studio at Trewyn, St Ives is a unique combination of sub-tropical garden and sculpture museum. Miranda Phillips, co-author of Barbara Hepworth Sculpture Garden led a guided walk around the inspirational setting – exploring the history of how the garden was developed and extended during the 26 years that Hepworth worked and lived, and also sadly died here in 1975. The garden has been in the care of the Tate since 1980. Kelmscott Manor is the famous Cotswold retreat of William Morris, who rented it from 1871 - 96. The house is a treasure trove of textiles, furniture, ceramics, metalwork and paintings by Morris, his family and friends. It was the location of a summer day out hosted by Architect Peter King & Val King, founders of The Rooflight Company (who created the original Conservation Rooflight). A tour of the Grade I house and gardens, was followed by an informative guided walk around Kelmscott village led by local resident Peter. The village contains cottages by renowned Arts and Crafts Architects Ernest Gimson and Phillip Webb. The house, gardens and village are worth repeated visits. Entitled The Tree of Knowledge, The Tree of the Cross and The Tree of Life - these beautiful tapestries were designed by the artist John Piper (1903 - 92) in 1976. We love the use of colour in the context of the sandstone walls.